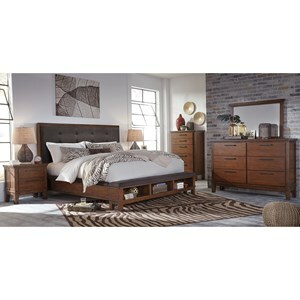 The Essex Bedroom Collection 8 Piece Queen Bedroom Group by Najarian at Sam Levitz Furniture in the Tucson, Oro Valley, Marana, Vail, and Green Valley, AZ area. Product availability may vary. Contact us for the most current availability on this product. Get your beauty sleep with the Essex Bedroom collection—the height of Old World elegance. Each piece in this collection is created with care and with an eye for detail. Gold scalloped carved detail, brushed nickel hardware, sumptuous quilted upholstery and luxurious mink-finished wood make the Essex furnishings ones to cherish for years to come. The Essex Bedroom Collection collection is a great option if you are looking for Casegoods and Upholstery in the Tucson, Oro Valley, Marana, Vail, and Green Valley, AZ area. Browse other items in the Essex Bedroom Collection collection from Sam Levitz Furniture in the Tucson, Oro Valley, Marana, Vail, and Green Valley, AZ area.